Gallery Exhibit: Sports Photography - "Our Moments in Time!" 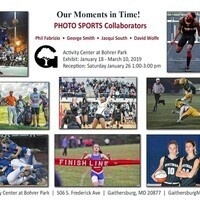 Four Montgomery County, MD freelance sports photojournalists team up to present their reflections on the stories behind their sporting news images in an exhibit called “Our Moments in Time!”. The Photo Sports Collaborators, three guys and a lady, are sideline photographers who have been documenting all levels of sports, from the school yard to pro venues, in and about Montgomery County for a variety of publications. Their selected work together with the living story about the image’s impact are on display at Bohrer Park, in Gaithersburg, Md. from January 18 through March 10, 2019. An artist reception will be held at Bohrer Park on Saturday, January 26 from 1 to 3PM. Phil Fabrizio, George Smith, Jacqui South and David Wolfe have crossed county venue sidelines and dugouts side by side over the past ten years. This print project was born out of a desire for a broader exposure of their work as together they faced a continuing decrease in distribution of local printed sports news coverage due in part to today’s online culture. To them a sports image, the temporary life span as it is in a news cycle, never provides enough true context for its ongoing existence. Thus, the reflected story behind the image. 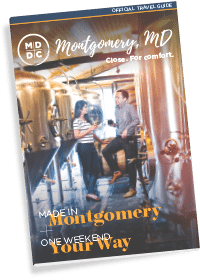 These four photojournalists images have and continue to be published in newspapers, periodicals and online web services, large and small, that are distributed to readers across the DMV. These include The Montgomery Sentinel, The Town Courier, Montgomery Magazine, The Washington Post, USA Today High School Sports, Montgomery Community Media, Bethesda Beat, The Monocacy Monocle, The Terrapin Times, Maryland Public Secondary School Athletic Association and former periodicals such as the North Potomac Times and The Gazette Newspaper, as well as, countless sports candid images in county high school yearbooks. Their work has been seen and now you can meet them at the artist reception on January 26, 2019 at Bohrer Park in Gaithersburg, MD.